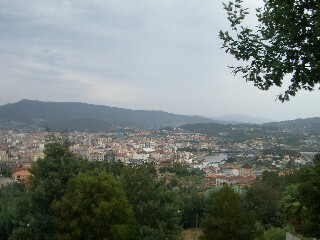 A Guarda is located at the south western tip of Galicia with the Mino river separating it from historic enemy Portugal. It is at the foot of the Pontevedra province in the Serra de Argallo. A Guarda is reached from the PO-552 or AG-57 roads that connect to the AP-9 toll road. Travelling time from Pontevedra is under one hour. The town has a population of just over 10,000 inhabitants with an economy that was foundered on fishing. Although now enjoying a more varied economy the town’s fishing heritage still remains important. Above, the town of A Guarda. Today however, tourism is becoming an increasingly significant part of A Guarda’s economy and the stretch of land that runs from Pontevedra to A Guarda is populated by tourists and the ripened fruits of the vine during the summer months. The town also benefits from a famous micro climate that produces plenty of rain in winter, but has an elongated summer with mild temperatures throughout the year. A Guarda’s short distance from Portugal also sees it gain day trippers from its now friendly neighbour. Settlements of one kind or another can be attributed to the present location of the town dating back to the first century and the Celtic Roman ruin of Citania de Santa Trega is a prime example. This important archaeological find looks down at the town from the mountain above and its location offers spectacular views out into the ria and back into the river Mino estuary. 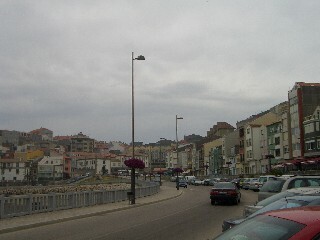 Right, the promenade at A Guarda on a very dull day. Today A Guarda retains its fishing port and a small L shaped key, but the town has definitely moved on with the times and this is also helped by the ease with which it can be reached from Galicia’s other towns and cities. Travelling time from Santiago de Compostela to A Guarda is about two and a half hours when using the toll roads.